In 2017, Canada experienced an increase in housing construction. With this surge comes a larger risk and greater opportunity for equipment theft. Experts estimate that 75% of stolen equipment is never recovered. Construction sites in the United States aren’t faring much better where $300 million to $1 billion worth of machinery is stolen every year. Some high-priced instances of construction equipment theft are committed by local thieves. However, organized crime has moved onto construction sites, often transporting equipment halfway across the world. One of the key risks construction sites face are subcontractors. Because construction sites are filled with various types of people coming and going, it can be hard to locate intruders. You may not be familiar with every person on your site at any given time, so it can be easy for criminals to blend in. Fences and gates may not be enough to keep unwanted visitors out. While often a good first-level of protection, they can’t always provide the security you need. Losing expensive equipment and tools can be costly to your bottom line. Not only will you have to buy or lease new materials, but you may experience a delay while waiting on the replacements and that can impact your revenue. So, how can you deter criminal activity and protect your valuable assets? One of the first steps is to utilize various layers of protection. The first layer includes low-cost measures like, locking equipment doors, removing keys and storing tools somewhere with controlled access. Speaking of access control, another layer of protection is to limit entry to the property to one single point. This can simplify keeping track of everyone who enters and exits your site. In addition, move parking spots further away from the site itself, making it more difficult for criminals to sneak equipment and materials from the property. A final layer is to use remote video monitoring as a proactive security solution. Trained surveillance operators watch construction sites in real time during monitoring hours. If they see something suspicious, they can activate a speaker warning to deter criminals and call local authorities. Police tend to respond faster to these calls because live surveillance video is proof of a crime in progress. 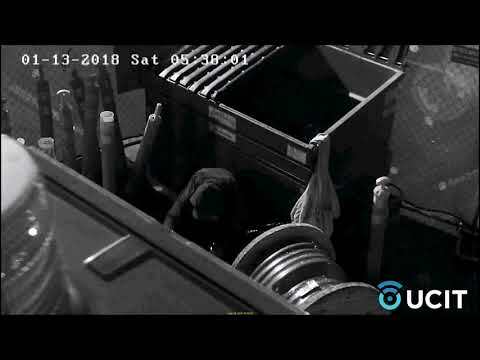 In the video below, our construction site security operators saw a theft at a construction site and called local police. Responding officers arrived and arrested the suspect before he could leave the premises. Construction equipment theft is a growing problem but using a layered approach can help deter criminal activity and keep expensive assets secure. If you have any questions about live video monitoring as a construction security solution, visit our website.